BAHRAIN NATIONAL DAY In observance to Bahrain National Day, all branches will be closed on December 16, 2014 (Tuesday). We will resume on December 17, 2014. 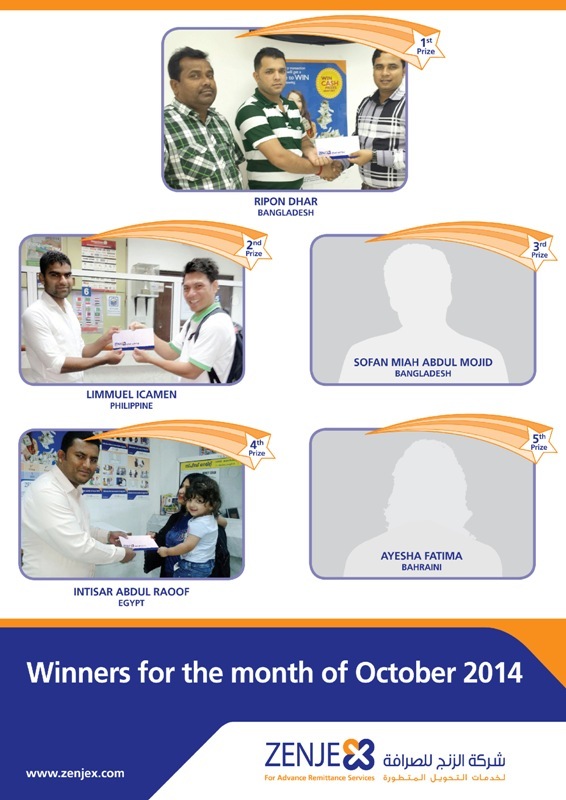 RAFFLE DRAW WINNERS FOR THE MONTH OF OCTOBER 2014. Congratulations to the following winners Send and be the next lucky winner!! ASHOORA HOLIDAY In observance to the above subject, please be informed that we are close on November 4, 2014 (Tuesday). All branches are open on November 3, 2014 (Monday) but timing is the same as Friday. AL HIJRA NEW YEAR In observance to Al Hijra New Year, please be informed that we are close on October 25, 2014 (Saturday).